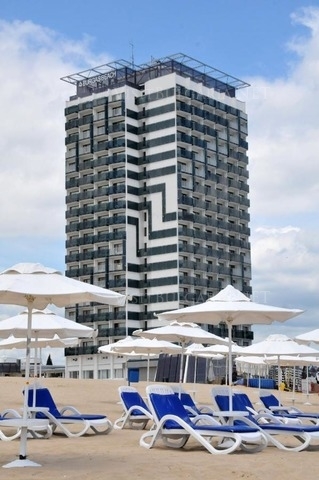 Bourgas Hotel in Sunny Beach resort on the Black sea in Bulgaria. Online booking. Great rates. Location: Bourgas hotel is located on the 1st line, 50 metres to the beach in Sunny beach resort on the Black sea in Bulgaria. Accommodation: Bourgas thotel is a 6 storey bulding. The hotel offers 50 sq. m apartments for two persons. Each apartment offers a folding sofa, double bed, air-conditioner, balcony, TV SAT, phone, internet access, floor surfacing - parquet, shower, hair-drier. The apartments offer kitchenette, electric rings, aspirator and fridge. Bourgas hotel offers elevator, safe at the reception, outdoor swimming pool, indoor swimming pool, animation programmes, (english, german), credit cards, ATM, rent-a-car, parking (free of charge), water slides, mini aqua park. Wine and dine: Bourgas hotel offers one restaurant and 3 bars serving delicious international dishes, as well as vegetarian menu. Children's entertaining programs, Children's pool, Kindergarten, Children's playground, Baby cot are also available. Sports: The hotel offers a volleyball playground and Mini golf course at guests' disposal. Billiards hall is also available in the hotel. Spa and wellnees: Bourgas hotel offers a medical cabinet, Beauty salon, hairdressing salon, fitness, sauna, solarium and Jacuzzi. Services: Bourgas hotel offers daily maid service, twise a weel linen is change, towels are changed 3 times a week. Cosmetic set is available in the bathroom.